From what the article says, these lads might be from New York City. It may be that they live in the projects in a broken home. How they came to be so foolish as to wear their pants down is unknown. What might have prevented their fashion faux pas is correction at an early age. “Foolishness is bound in the heart of a child; the rod of correction shall drive it far from them” (Proverbs 22.15.) No matter how deficient their upbringing has been, whether by lack of father or want of mother or both, who will believe that the lads know no better? Just watch your five year old kid put his pants on next time. He knows enough to pull them fully on. So we can conclude, if we suppose that the lads are as smart as five year olds are, that their failure to pull their pants up is not due to ignorance. Notice the comment by Markus. 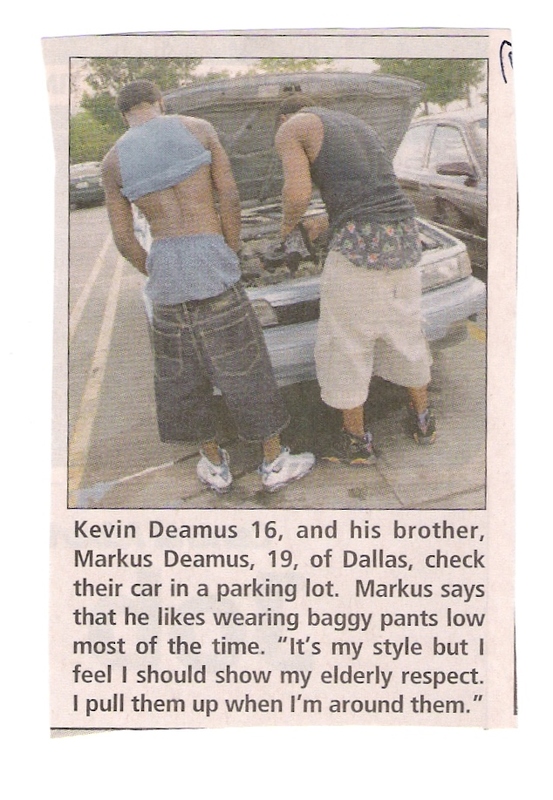 He says that he pulls his pants up to show respect to elders. He knows that this behavior is offensive, then. The brothers are in a parking lot. Are there no elders around? The truth is, the foolish lads wear their pants like that to throw attitude around, just like the rappers do. They walk after the fashion of their idols. Nothing is more a mark of spiritual and moral darkness than the foolish things the prince of darkness makes his subjects do. He makes these lads think they’re tough even while they walk around like babies needing a diaper change! That’s Cunning with a capital C! That’s Deception with a capital D! The devil knows how to fashion a fool!